Sweetfish 香魚 (aka 桀魚) may have a connection with Tamsui. Read on. Once aplenty in 碧潭Bi-tan, the fish went extinct in 1980. Those available now are farmed from Japanese stock. The extinction has always been blamed on over-fishing, which is only partially true, because it was really owing to the disruption of the life cycle of sweetfish. We now know, in the not too distant past, sweetfish traveled from the sea up to a special brook in 瑞芳 and went upstream to spawn at the very source of the water, 桀魚坑. Just like salmon, when the adult fish reached sexual maturity, they would return from the ocean to spawn in their ancestral fresh-water habitat. The ones in 碧潭 would have started their journey from Tamsui by entering through the mouth of Tamsui River from Taiwan Strait and went all the way up 新店溪XinDian River to 碧潭 and beyond. 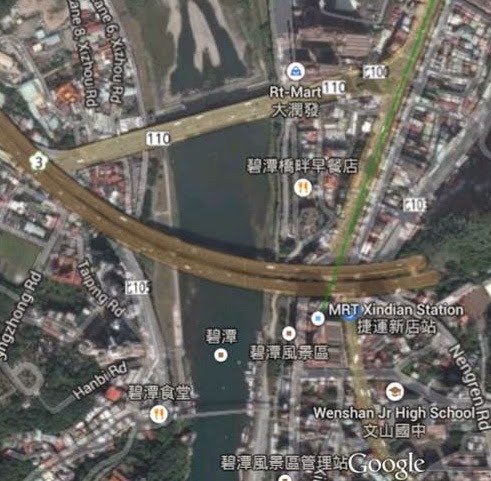 For a time, the fish was often caught in Tamsui River (see here) and appeared in 瑠公圳; the latter an aqueduct built in 1753, channeling water from 新店溪 to SongShan area before it became an open sewer in 1934 (now covered up, sandwiched between the in- and out-bound lanes of 新生南路). In 1922, small estuaries were actually constructed along 新店溪 to facilitate spawning of the fish; the efforts did not continue, however. 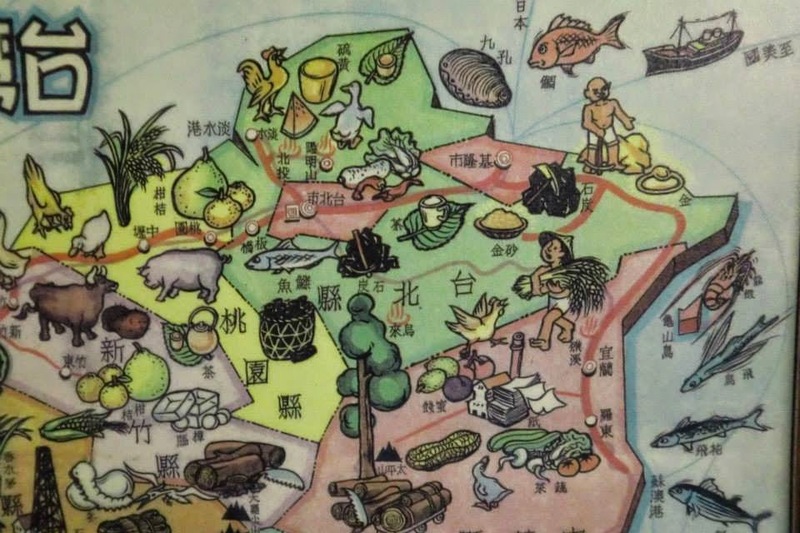 In fact, the 1951 map (above) also shows 桀魚 (fish symbol below pink 台北市 among noted product of Taiwan. 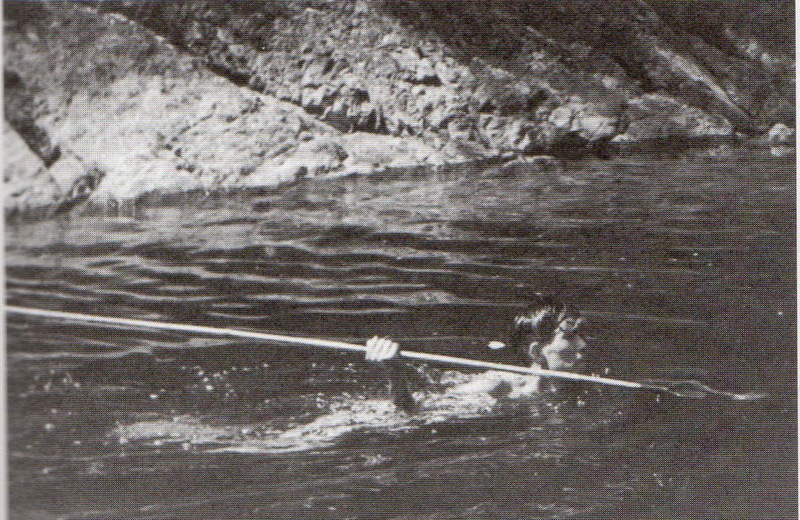 Around 1955, to maintain the water level of 碧潭 so the water supply to surrounding areas and boating activities for tourists could be sustained, a low-tech stone-dam using 竹蛇籠 (grapefruit-sized stones packed into long cylindrical bamboo cages) was built downstream from the suspension bridge (below). Without any fish ladders in place, this dam effectively cut off the home-coming path of sweetfish. Worse, the fish upstream were trapped and every single last one was caught and eaten (hence the urban legend of over-fishing). Google maps show a newer dam immediately downstream from Route 110 Bridge (秀朗堰, built in year 2000). 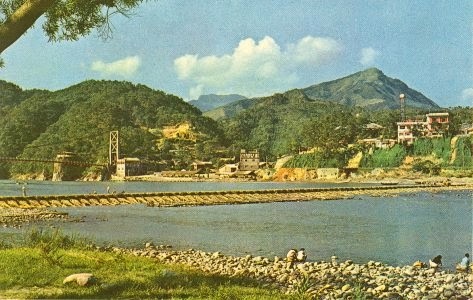 Also, 直潭壩 upstreams constructed in 1973-78 as a drinking-water reservoir for the Greater Taipei. Fish ladders were never in the plans. Even if any, it'll no longer be relevant as the original red-finned 桀魚 is long gone. Thanks for this interesting piece of information. I have always wondered what had actually happened to the fish, never bought the over-fishing story because they disappeared so quickly. Thank you for providing those images which are important time-stamps.